A good US employment report was balanced off last week by further slides in a number of emerging market currencies, a softer reading in the JPMorgan Global Manufacturing PMI and President Trump's threat to expand tariffs to cover all Chinese imports. 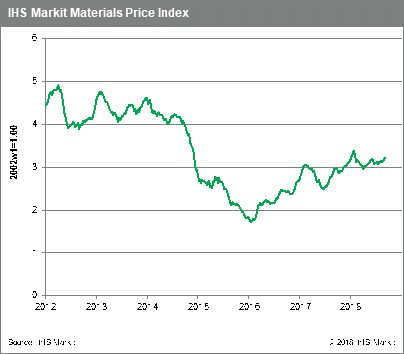 Although our Materials Price Index did post a 0.4% gain for the week, daily prices were sagging at week's end, with over half of the index's sub-components recording declines. Chemicals prices continued their rally and were the driver behind the MPI's rise last week, increasing 3.0%. The Fiber index also rose fairly strongly, increasing 2.7%. Oil ticked up 0.2%, though prices retreated at week's end on President Trump's latest trade threats against China. On the downside, freight fell for the first time in 12 weeks, dropping 3.4%. The ferrous and non-ferrous metals sub-indexes also dropped last week. Along with rubber, metals have been the weakest performers within the MPI for the past year, especially so since January. Our view of the near future shows commodity prices fairly flat. A number of individual markets look technically oversold, while others still look fundamentally tight. However, a number of events threaten to create further volatility - a late September rate hike by the Federal Reserve, and in October, the presentation of an Italian 2020 budget plan to the European Commission that may test its credibility. These tests will be followed by the October 23rd enforcement date for US sanctions against Russian aluminium, and following almost immediately thereafter are the US mid-term elections. Expect an interesting fourth quarter.